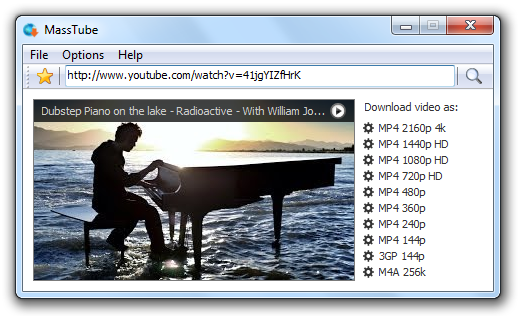 description (en) MassTubePlus is a lightweight and popular application to quicky download videos from YouTube. - download VEVO, age blocked videos and others. - download in Full HD 1080p, Ultra HD 4k 2160p, HD 720p and in other popular resolutions. - download in MP4, 3GP, MP3 and in other popular formats. - compatible with Windows XP/Vista/7/8/8.1/10.